While doing my MOOC with Coursera on Inspiring Leadership through Emotional Intelligence*, Prof. Richard Boyatzis, the Course Instructor shared with us a host of videos that were inspiring. Of it all, the one that captured my attention and being was that of a YouTube video on Under Four Trees – a school that was started by Mrs. Zikhali for a small community in Nkomo Primary School in rural KwaZulu Natal, Mnqobokazi, South Africa. The amazing project is sure to leave you inspired. Do watch this link below – and if you are in the field of education, this is a must watch. The power education can wield even making the poorest of the poor, rich. Passion for what one does can convert all of the problems into possibilities. Two wonderful lessons. It is not that these are eureka moments – it has always been there. However, when one sees the fruits of the events through videos and films, it conveys home a very strong message, and encompasses you with an unshakable faith that there is nothing that we cannot accomplish. 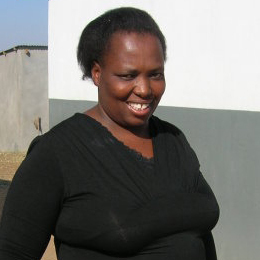 When Nomusa Haslot Zikhali, the Principal, reached Mnqobokazi to start the school, she was flabbergasted. There were no buildings. No resources. Just a wild field replete with undergrowth and bushes. The challenges were too many. Inclement weather. Rains that would make the stream they had to cross overflow with water. Crocodiles in the stream. Dust laden winds. Parents wanting their children to look after cattle or even younger siblings. And that was when she decides to move closer to the community and set up the school. She had to go from home to home in the community to impress upon them the need to educate their children. Her passion to educate these children weighed high than the troubles and travails. In spite of that, in January 1999, there were just 10 children ready to join the school. And where was the school started? Under Four Trees!!! Each class – Classes 1 ,2, and 3 were allotted one tree each and the fourth one was Mrs. Zikhali’s office. As an educator, I am ashamed to say that I would have given up and just left the place for greener pastures. I am sure 99% of us educators would have done that. But not, Mrs. Zikhali. She persisted. And converted every problem into a possibility. The government did send other teachers to start the school, but they all gave up. Mrs. Zikhali on the other hand took the challenge head on. Thus from a one-teacher-220-student school, Nkomo Primary School has moved into another league now: 900 students and 23 teachers. Eight classrooms. And plenty of support from Africa Foundation to raise money for infrastructure. Another challenge Mrs. Zikhali had to face was the presence of most vulnerable children in her school – whom she calls Child-headed Households, a chilling euphemism for those whose both parents were dead. Her school now has 153 of them – i.e. 17% of the under-13. To persist under these challenging and emotionally draining circumstances requires determination and the keen desire to make a difference in these students’ lives, which she had in plenty. Her inspirational tale of nurturing, educating and transforming has been made into a movie called Under Four Trees by filmmakers Suzanne Cross and John Simpson. Thank you Mrs. Zikhali for teaching me some very crucial lessons. The best one I will cherish and practice is to convert every problem into a possibility! If we look for solutions we can think creatively and find a way or two. However, many of us look only at the problems and therefore the possibility of a solution is just not there in the vicinity or in the periphery. May your tribe increase and be beacons that will enlighten the path of many educators like me.